﻿Motivational stories have the ability to raise our spirits, to encourage and motivate us, and to teach us valuable life lessons. They can be used as stepping stones toward living a better life. 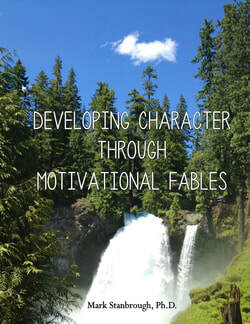 The 60 stories in Developing Character Through Motivational Fables are full of inspiration and motivation. Some are fables using stories of animals, plants, or forces of nature and others are parables illustrating a learning lesson. The stories demonstrate the qualities necessary to be successful in life: good character, integrity, a strong work ethic, dedication, and perseverance. Many of the stories have been passed down through history, but all of the stories have a lesson. The short stories are designed to be read in a few minutes, and can be posted on bulletin boards or distributed for group discussions. The affirmations, questions, and quotes at the end of each story are designed to inspire thinking, encourage, challenge, and develop character.